Center for International Forestry Research (CIFOR), Claudia Romero (University of Florida, USA), Centre de Coopération Internationale en Recherche Agronomique pour le Développement (CIRAD/France). Sustainable forest management certification enjoys wide support; yet critical evaluation of forest certification has not been carried out. Most studies that have attempted to study the impact of SFM certification have methodological shortcomings, such as selection bias (non-random participation), or lack a robust understanding of market impacts of certification at firm and farm levels. With these deficiencies, its not possible to assess the impacts of forest certification on forests, firms, employees, and rural communities with any scientific precision. This activity financed a three-day workshop on evaluating the impacts of certification in Montpellier, France, on 12-14 November 2011. Participants representing the evaluation community, economists, sociologists, ecologists, and foresters discussed and decided on an integrated evaluation method to elucidate whether certification is achieving its set objectives in different countries.The workshop assembled an overview of available quantitative and qualitative approaches to impact evaluation for tropical timber certification; and provided an opportunity to assemble the expertise needed to develop a research agenda for evaluating the impact of forest certification. It is essential to use systematic analyses when making decisions on forest management and practices. These include better understanding of the complex dynamics and theory of change of forest sector interventions as well as on the ultimate objectives of forest management. 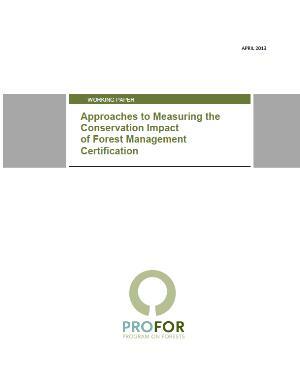 Despite not having full understanding of all the dimensions and impacts of forest management certification, it can be assumed that certified forests are, on average, most likely better managed than noncertified forests. Certification also ensures to the public that sustainability of forest management is promoted. Forests provide several benefits. Forest management certification mainly deals with the productive functions of the forests and with ensuring that these functions can create economic goods without jeopardizing social benefits and environmental sustainability. National governments and donor agencies should continue their support for well-managed sustainable production forestry, and forest certification is one instrument for achieving it. Methodological challenges in measuring the impact of forest certification cannot be interpreted as lack of impact. Forest certification increases the information available in the marketplace for all participants, and this improved information increases confidence in certified producers. Having better and scientifically verified information on the impact would improve the information base even further and could also be used to improve the design of certification schemes. The workshop and working paper available on this page have contributed to defining a research project on the field impacts of SFM certification conducted by CIFOR, the University of Florida and CIRAD. Implementation of the research will require extensive support as well as collaboration and sharing of experiences by a wide range of stakeholders and institutions.